FIT U Training 360 is not your average gym. Which is why we don't deliver average results. From group training to kids'/seniors' classes, private training to sport-specific coaching, FIT U caters to the individual, making it the ultimate athletic training center. One-size-fits-all is rarely true in the dressing room, and we don't believe it works in a fitness setting either. Every athlete has specific needs, unique strengths and one-of-a-kind concerns. Our coaches hold certifications from the best training organizations in the country and are well-equipped to meet the individual needs of every client that comes through our doors. 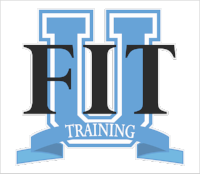 FIT U is a ten-thousand square foot indoor athletic training facility. In addition to the indoor facility, equipped with the best functional and sport-specific training equipment, we are lucky to have an outdoor turf field as well. Having that much space means we have a lot of options -- and you'll never have to do the same workout twice! If You are tired of the same results, Call us today to find out how Fit U can work for you! Planning to join us? Please bring the Health History and Liability Release to your first session!